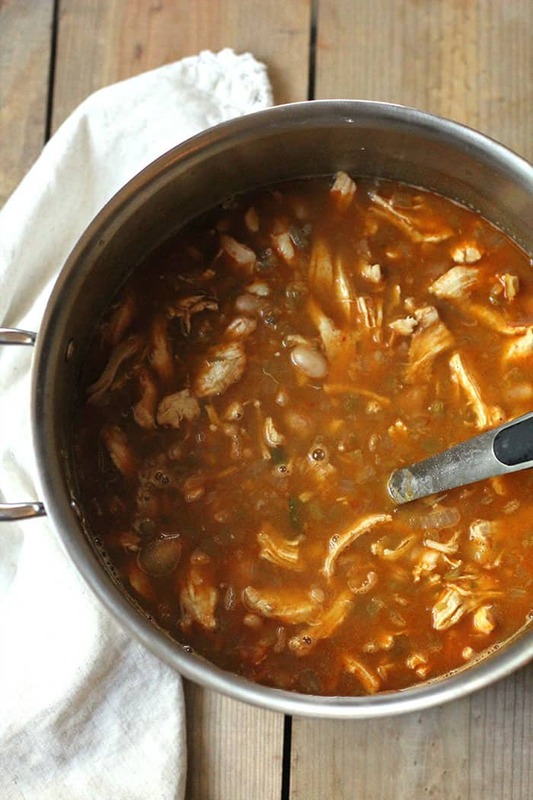 Hearty Chicken Chili will keep you warm and full on chilly days. 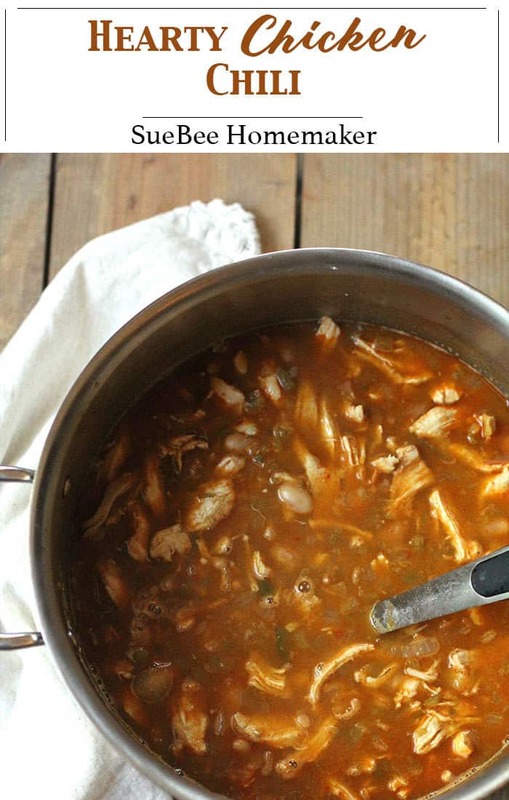 Full of protein with plenty of chicken and white beans, this easy chili also has some spice. Tailor it to your taste buds! It’s Winter here in Texas, and by that I mean it’s a chilly 30-something degree day. My blood has definitely thinned since moving south some 25 years ago. I grew up in Iowa, and below zero days are something that I’ll never forget. Wearing a scarf wasn’t for looks on those days. It was to protect the moisture in your nostrils from freezing as you stepped outside. Yikes. I’ll take my 100 degree summer days, even though I dislike those too. We’ve been eating a ton of soup and chili this month. and the list goes on. I think my fam might be getting slightly sick of all of it, but they aren’t complaining. So I’ll just keep whipping up what I love most…SOUP! Since we’re eating lean and mean this month, I’m glad that my soup recipes are pretty healthy. I’ve updated many of my recipes to include nutritional data, so feel free to browse. I’m trying to make a wide variety, but if you have suggestions, please let me know in the comment section below. This recipe is definitely lean and mean! Even though we’re cutting back, I still have to sprinkle my soups with AAALLL the goodies – the cheese, chips, avocado, crackers, and sour cream. I’d rather eat less of it and enjoy every bite, as opposed to my hubby who would rather eat two large bowls of just plain soup. No toppings. Nada. That’s why we get along so well. He likes quantity. I like quality. 🙂 ha! Again, I tend to over-spice my recipes at times. Which is why I usually don’t write them exactly as I cook them. I don’t want to scare you away, so I tend to reduce the jalapeños, red pepper flakes, and green chilies for YOU. So if you like extra spicy, add more. If not, add less. YOU control how spicy you like your food. 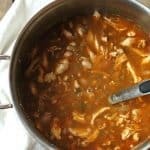 Full of protein with plenty of chicken and white beans, this easy chili also has some spice! Tailor it to your tastebuds! In a large stock pan, heat olive oil to medium heat. Add diced onion and jalapeño, and sauté until softened, approximately 4-5 minutes. Add garlic, salt and pepper, cumin, chili powder, and red pepper flakes - and stir another minute. Add chicken broth and green chilies, and cook until boiling. Turn heat down slightly and add chicken breasts. Simmer for approximately 20 - 25 minutes, or until chicken is cooked through. Meanwhile, mash one can of cannellini beans. Add to pot, along with the other can of beans. Remove chicken to shred. Add it back to pot and simmer on low for another 10 minutes. Check seasonings and adjust according to your tastes. Serve with optional garnishes - cilantro, avocado slices, tortilla strips, sour cream, shredded cheese, sliced jalapeño, etc. Rotisserie chicken can be used for a shortcut. You can use any kind of beans. Tailor the spice level by adjusting the jalapeños, chili powder, cumin, and red pepper flakes. Leftovers are great for up to five days, stored in the refrigerator. 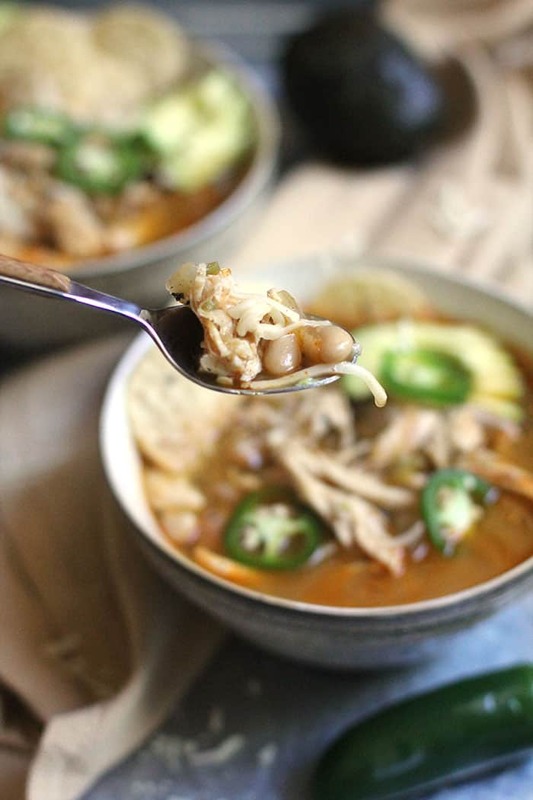 We finally made your famous chicken chili. I ate so much I will be miserable for hours. Delicious. You got 7 thumbs up from our table of 4. Abigail is still debating on the 8th thumb. So good. 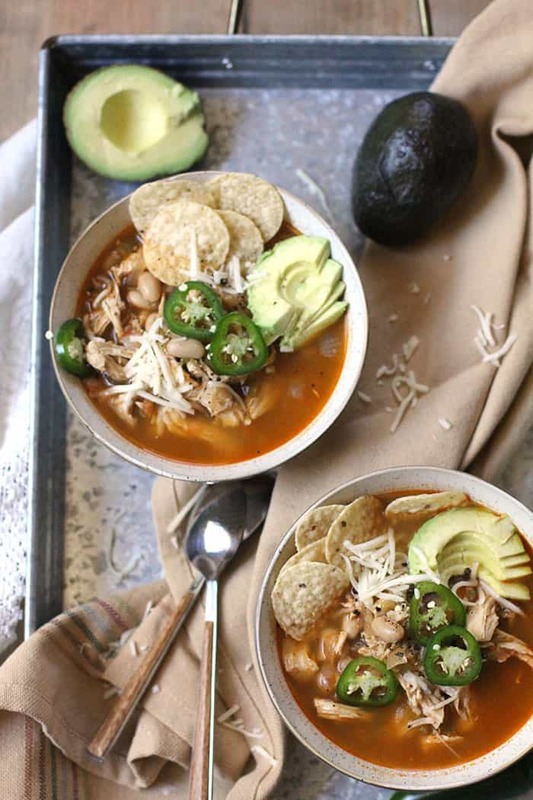 With all of this Texas cold weather, I was looking for a new soup and this was great and easy. I used Rotessiere chicken from Sam’s Club that I had at home. Will definitely make it again!!! Yes, this one is a winner for cold weather! Great idea to use a shortcut too, Michelle! Loved it!! Even Jonathan liked it (he’s not much for beans) so I said next time I’d make a double batch with some thigh meat as well. We made this tonight and will for sure make again! I had already had chicken cooking in broth in the instant pot before decided on what to do with it, so I modified a bit. I got the rest of it going, and then added my shredded chicken (and the broth) in. Next time, I’ll make it as stated here or else try to do the whole thing in the Instant Pot. Delicious AND healthy – awesome!! Whoaza! I get all of that for 371 calories! Sold!